The sunny weather we've all been waiting for is finally here! 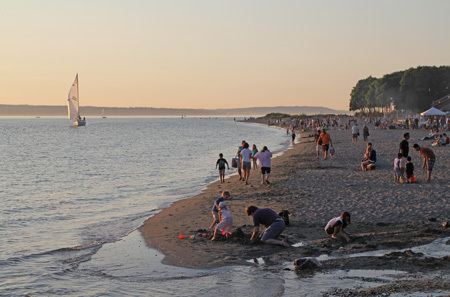 Whether you're heading to the spray park at Ballard Commons or taking in a late sunset at Golden Gardens, there is no shortage of opportunities to get outside. If you're looking to combine sunshine with a delicious pint of beer, we hope you will join us on July 27 at Reuben's Brews for what is becoming one of our favorite annual fundraisers. For every pint/growler/set of three tasters you purchase between 11 a.m and 10 p.m., Reuben’s will donate $1 to Groundswell NW. We're hoping to raise $500 this year, enough to fund a microgrant for a local project that supports neighborhood parks, open space and habitat. So come raise glass with us and support Groundswell NW! Groundswell NW has been busy sprucing up for summer with a successful work party at the Sunset Hill - Shilshole Gateway and a clean up event with Seattle Clean Street Collective who was also a recent recipient of a Groundswell NW microgrant. Our microgrant program is a great opportunity for local groups who need a financial boost to tackle projects that will benefit neighborhood open space. If you have ideas for a local project that could be fully or partially funded with a microgrant, or if you just want to know more about the program, you can find information and an application by clicking HERE.